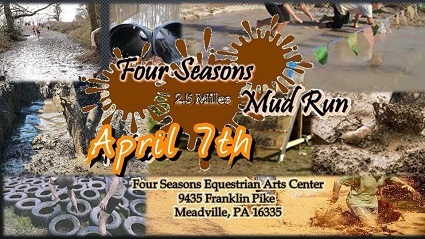 Four Seasons 3rd Annual Mud Run will be held Saturday, April 27th, 2019, at Four Seasons Equestrian Arts Center in Meadville, PA.
Four Seasons 3rd Annual Mud Run! 2.5 Miles of Muddy FUN!!! Proceeds benefit Crawford County Youth Horse and Pony Program. Those registering by April 13th, will receive a complimentary Four Seasons Mud Run T-Shirt on Race Day! Must be 10 years or older to race, those under 12 must be accompanied by an adult through entire course. This is an obstacle run in the mud, participants will be required to cross over water, crawl in the mud, climb over obstacles, run up and down hills – all participants enter at your own risk!